You never know what you’re going to find when you move. You start boxing things up and pretty soon you’re stumbling across stuff you’d forgotten about years ago. That’s what happened to Lee Sutton. An amateur motocross racer in the 70s, Lee uncovered a stash of photographs he’d shot during his time at the tracks of Northern California. Unfortunately, about half the negatives were ruined. After all, in 1975 there wasn’t much for someone to do with a bunch of pictures like this. You could share them with friends — provided they lived nearby and you got together to have a look. You could submit the best of the best for publication somewhere. Or you could put them in a box. Today, things are different. Lee picked out the best of the surviving photos and did what anyone would do — he uploaded them to a Flickr photoset. Within days knowledgeable fans had annotated the pictures with details and reminiscences of racetracks, riders and their machines. This entry was posted in Motorcycling, Racing, Vintage. Bookmark the permalink. Oh man, those are some great shots. Glad to hear you salvaged at least some of them. The Trans AM-AMA series was the best!! Europeans vs USA. Bikes were in transition. Factory bikes too!!! Truly all the big names throughout the world. Our riders starting to make the rest of the world notice. Outdoor tracks. the Trans AM series gave true MX fans goosebumps. I have lots of photos, just have to figure out how to post them. 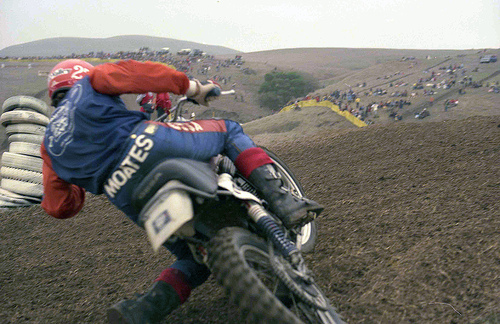 In this link you can see a video of Spain vintage MX race!! Hello, Great to see some old shots and hear how much seeing them means to some who were lucky to be involved in the worlds most awesome sport back in the 1970’s. I would really love to find anyone who might have photos, videos, results, articles, memorabilia from early to mi 1970’s World Mini Grand Prix events held at Indian Dunes in Valencia Ca. If anyone has contact information for Brian Meyerscough, Jim Holley, Jeff Ward or other racers that competed in those events that would be awesome. ( I competed in the 1974 and ’75 events) ANY tips ,leads would be REALLY appreciated! I beleive a man by the name of Hendrickson? (Daryl?) was the organizer, promoter. He may have info also. Thank You VERY, VERY MUCH. D.J. Hashman. Would like to find some old school raceiss and Photos from 1978, 1979,and 1980; In Michigan for the 80cc class…I used to Race with eddie warren, Johny Kitch, stony Horn, and a few others; I was 15th in the state and My number was #163….